Many, many years ago when I was starting out as a hiker and backpacker a new outdoor company was also starting. This was Rohan, now well-established in outdoor and travel clothing, but back then tiny and unknown but also, crucially, innovative. Wool and cotton were the standard clothing fabrics back then and there was shock and horror in the outdoor industry when Rohan suggested stretch nylon and polyester-cotton could perform better. Rohan was right though and I wore Rohan clothing on my first long walks. I haven’t had a close relationship with Rohan since the 1980s but recently co-founder Sarah Howcroft, who left the company a long time ago, told me she was involved in a new venture about Rohan and its history and asked if I would like to contribute. When I’d stopped reminiscing I said yes and wrote a piece about my first contact with Rohan that has just been posted on the new Rohantime website. It can be found in the Flashback section under the name In The Beginning. There will be other posts in the future. My Rohan involvement was long before digital cameras so all my photos from then are transparencies, which I’ve never had scanned. However Sarah offered to scan some to illustrate my posts and two have appeared, one taken on the Continental Divide Trail and showing me sitting by a camp fire wearing a polycotton Moving On windshirt and polycotton Bags trousers, both of which lasted the almost 6 month long walk well, and one taken at a campsite on my length of the Canadian Rockies walk showing me wearing a T Major shirt and Bags trousers. As I haven’t any digital images of myself wearing Rohan clothing the photo accompanying this post shows a friend climbing Suilven a couple of years ago in his old but still functional Moving On windshirt. Sarah will be sending me the scans of my photos soon and I’ll post some here. 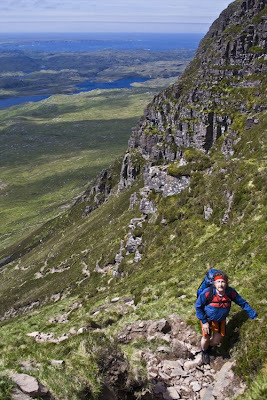 Photo info: On the ascent of Suilven. Canon EOS 350D, Canon EF-S 18-55mm @22mm, 1/125@F5.6, ISO 100, raw file converted to JPEG in Lightroom 2. Ah yes, in the days of Paul and Sarah Howcroft Rohan was a great innovator. I think I still have some of the original catalogues. I had a lot of their stuff. Some of their design and colour range was a bit whacky, but good stuff overall.